When You take a New York City Skyline Cruise, sailing from the Worlds Fair Marina in Flushing Queens, you’ll see some of the most iconic sights in the world, but you’ll also pass areas with extraordinary history that may not be as well known. Did you know that our luxury ship, the Skyline Princess, passes over an area where there is reputed to be buried treasure and was also the site of a controlled blast that was the largest manmade explosion in history until the Atomic Age? 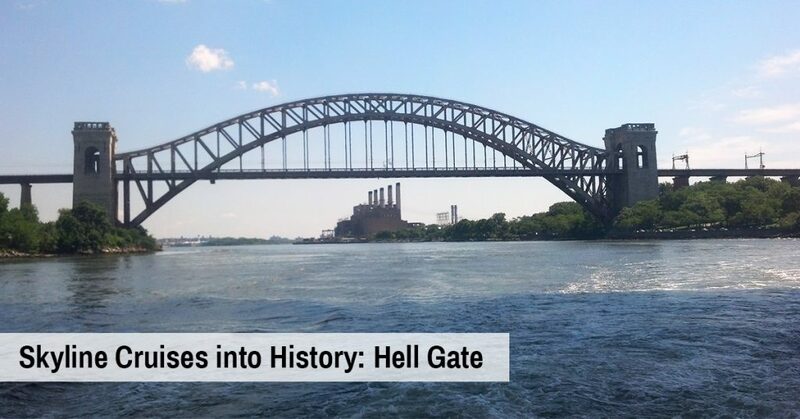 It’s called Hell Gate and it’s a fascinating piece of NYC history that you won’t see on any other local dinner cruise. Cruising into history and getting a unique view of so many famous places is just one of many reasons why a Skyline Cruise is perfect for any occasion. We host all types of events large and small. From corporate outings to church group affairs. We’re the perfect venue for celebrations large and small. We’ll host a Bar or Bat Mitzvah, birthday, Sweet Sixteen anniversary party or wedding. If you have an affair that’s big enough, you can charter the Skyline Princess. We provide full ship private charters from many ports in NY, NJ, LI, Westchester and CT, or you can leave from our home port at the World’s Fair Marina. For smaller gatherings, we can serve a private deck on one of our public cruises, a group of tables or even a small party with just 2 to 4 people. And it costs much less than you think! What could be better than holding your event in the shadow of the New York Skyline where you’ll see famous places as The Empire State Building, United Nations, Brooklyn Bridge and Statue of Liberty as well as hidden treasures like Hell Gate. Because Skyline leaves from Flushing Bay and cruises to the East River, we cruise directly under the century-old Hell Gate Bridge, and we’re the only cruise line in area that does so. For much of its history, Hell Gate was a treacherous passage. That’s because the area was lined with reefs and alluvial boulders which made it difficult to pass through the area and created the conditions in which whirlpools and eddies formed around rock formations when the tidal current passed above the rock, according to the blog Brownstoner. Ships would avoid passing through the area, but some captains tested their skills by attempting the trip. During the American Revolution, British Admiral William Howe took the risk and was able to get ships through Hell Gate in October 1776. But they weren’t so lucky in 1779 when a British frigate struck a rock near hell gate and allegedly lost gold purported to be worth millions today. By the mid 19th century, a thousand ships a year were damaged in the area every year, according to Brownstoner. It took engineers decades and lots of explosives to solve the costly problem. In 1850 they began blasting rock away, with the US army beginning the process of clearing reef in 1876. In 1885 engineers began to insert explosives to clear the reefs, culminating with the largest manmade explosion prior to Hiroshima, according to eastrivernyc.org. The passageway is spanned by the Hell Gate Bridge, which celebrated its centennial in 2016. According to Amtrak, which maintains the bridge, it was the longest steel arch bridge in the world when it was completed in 1916. Today the waters by Hell Gate are much calmer than they were 150 years ago, a tribute to the ingenuity of America and New York City. The Skyline Princess cruises under the Hell Gate Bridge from the World’s Faie Marina and it’s our Gateway to the East River and the spectacular New York Skyline. We’re the only local dinner cruise line the passes this way and we want to share all of the history and majesty with you. Contact Skyline today.